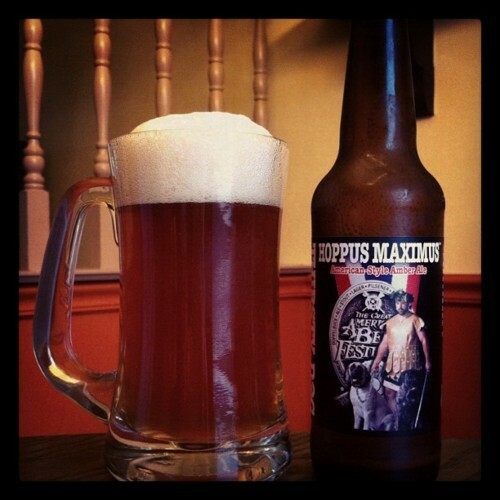 Hoppus Maximus, an American Amber Ale, is brewed by the Thirsty Dog Brewing Company, located in Akron, Ohio. There isn’t much to be found about Thirsty Dog on the Internet. Their website isn’t incredibly detailed and there is no company history. As per the beer, it’s described as “crisp and refreshing,” and a beverage that blends American hops and caramel malts together to make a winner. Winner, indeed. Take one look at the bottle, and you’ll see the silver medal they won at the 2001 Great American Beer Festival. It’s front and center, and is hard to ignore. I suppose we should just get to the beer and maybe answer some of these questions. As soon as I opened the bottle, this beer was aching to be poured and to make a head. Transfer to glass produced a large, creamy, and lasting head that billowed over top of the glass — always nice to see. The beer itself was orange-amber in color, with a very hazy body that contained a light amount of particles and sediment. 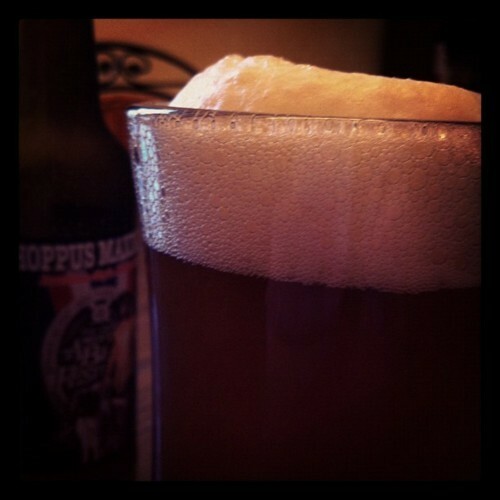 Both the lacing and head retention were excellent, and Hoppus Maximus kicks things off on a very high note. The aromatics were just as advertised, and typical of an American Amber. This beer was very well balanced to the nose, with both hops and malts playing equal billing. The hops are there in the form of citrus, specifically grapefruit, and the malts are heavily caramel, with a slight grainy note. As mentioned, typical for this style, but maybe slightly hoppier than you’d expect. 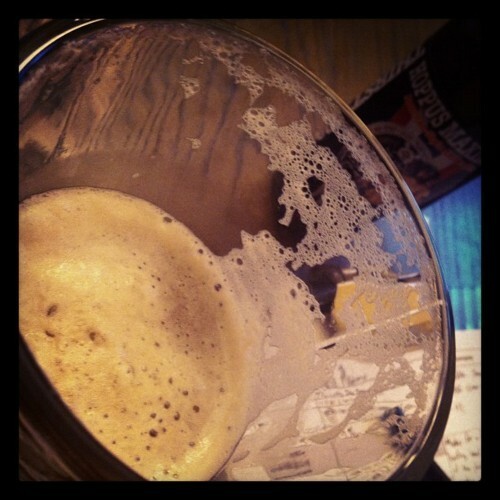 The taste starts malty, showing off a roasted bready character that transitions into some sweet caramel. The middle of the taste is where the hops begin to show, in the form of grapefruit, and at first transition, it’s a very sweet hop presence. That turns more bitter on the finish, but never exceptionally bitter like some India Pale Ales can be. 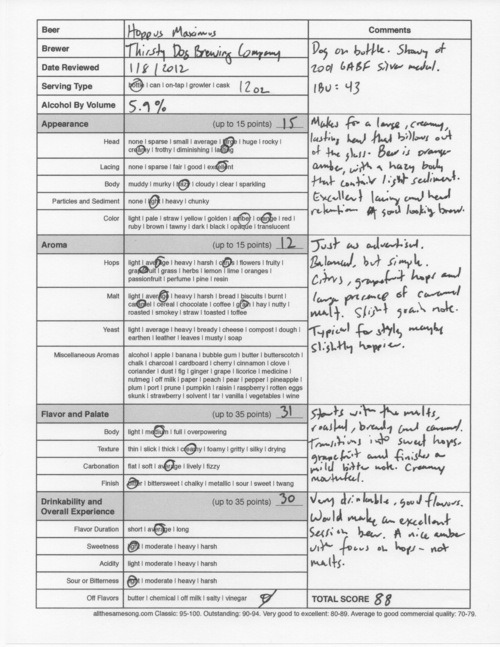 The mouthfeel is creamy and pleasant, with the finish lasting a reasonable time. I marked the carbonation as “average,” but at second blush, it’s probably a little higher than average, and makes the drink more appealing. Yes, let this be a lesson: Sometimes what one might consider goofy on the bottle doesn’t lead to goofiness inside of it. This is a very quaffable, downright good beer with nice flavors. Hoppus Maximus screams “session beer,” and at just 5.9% ABV (alcohol by volume), that’s doable. This is a nice Amber Ale with a slightly shifted focus on hops, hence the name. Worth a try, I will come back to this one! Thirsty Dog Hoppus Maximus, 88 points. Price: $2.29 US for one twelve ounce bottle.